Interpreting Tombstones: Statuary, Emblems, Symbols and more, a Brown Bag program. The McLennan County Cemetery Interest Group (MCCIG) will share some of their greatest cemetery finds. Learn to interpret the emblems and symbols on tombstones to unlock the valuable family information beyond simple dates. 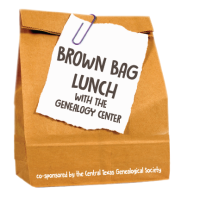 This event is co-sponsored by the Central Texas Genealogical Society.